Green Tea Smoothie Recipes - 3 Easy Ways To Start Your Day! 3 Easy Ways To Start Your Day! These green tea smoothie recipes are like one-stop shopping for breakfast - it has all the health benefits and antioxidants of green tea in a nourishing, satisfying beverage that takes only minutes to prepare! Do you remember how your mother always claimed that breakfast was the most important meal of the day? Well, it’s true! Unfortunately, many people live such busy lives that there simply isn’t enough time in the morning to prepare a healthy, nourishing breakfast. This drink is for those people. It seems like half of the yogurt section in the grocery store has been marked up and labeled “pro-biotic,” but if you use a good quality plain yogurt that contains a variety of active cultures you’ll get the same benefit and spend less money. For people who need a little extra jump-start in the morning, using regular (non-decaf) green tea provides a subtle energy boost from the caffeine. Are you ready to try the following recipes? Combine all ingredients in a large blender until smooth. Makes enough for 3 large or 4 small smoothies. This recipe is excellent for breakfast on-the-go. Combine all ingredients in a large blender until smooth. You may add lowfat milk, as needed, to get the proper consistency. You may swirl a little chocolate syrup on top as a garnish. Makes enough for 1 large smoothie. Thirsty for more suggestions? 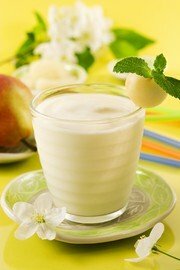 Check out the Juicer Detective website for more green tea smoothies recipes.